War and Peace (Russian: ????? ? ?? ?, Voyna i mir; in original orthography: ????? ? ??? ?, Voyna i mir") is an epic novel by Leo Tolstoy, first published from 1865 to 1869 in Russki Vestnik, which tells the story of Russian society during the Napoleonic Era. It is usually described as one of Tolstoy's two major masterpieces (the other being Anna Karenina) as well as one of the world's greatest novels. This book is better than I expected, and I expected a lot after Anna Karenina. 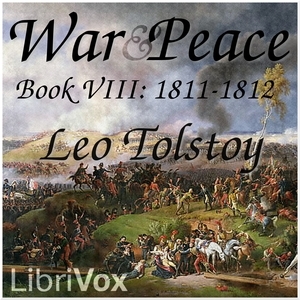 The Librivox recordings are interesting, as different volunteers record different chapters, so you get accents from across the world in the course of a volume of Tolstoy. It's remarkable how little that gets in the way, and even adds something to the experience of the book, which is of course also panoramic. Some read very slowly, others very fast; sometimes the accent is so thick I miss a word. But it doesn't bother me in the least, and you can always go back to get a word.